January is a great time to start thinking about you! It's important that we take a little time out of our hectic schedules, to just rest, relax and relish a moments peace. Green tea and well-being go hand in hand, so why not give it a go! Green teas are absolute powerhouses of goodness! They are beautiful, light and vibrant teas which boast so many different health benefits. Perfect for when you want to cut down on the coffee and choose something with less caffeine. Don't forget the brewing temp though! So many people make the mistake of brewing with water at too high a temp, resulting in that nasty bitter taste so many of us associate with green tea - time to banish those thoughts, brew all your green teas at 70-80°C ALWAYS!! Either allow the water to cool after boiling, get one of those fancy kettles that you can select the temp or (our favourite) add a splash of cold water directly on to the tea leaves to protect them, then add your hot water! Ta-dah! perfectly brewed green tea every time!! There are so many different types of green tea, you're sure to find one that suits your preferences! Psst! With 15% off site wide if you enter discount code JAN19 at the checkout right now, there is no better time to give one a go!! A staple green tea for everyday use. This is a smooth, gentle, fragrant tea if brewed for 3 minutes. A deeper flavour when brewed for longer, remember to brew any green tea you should only use 70-80 degree water! Bursting with antioxidants, this tea is a must for every kitchen cupboard. Starting with a base of Sencha green tea leaf with the sumptuous addition of pineapple, ginger and ginseng root. This tea has a very light, fresh, sweet and smooth flavour - ideal for someone starting out on their green tea journey. Green Tea Ginseng is said to naturally boost energy, help with weight loss, lower blood sugar and cholesterol levels, all whilst reducing stress and promoting relaxation within. A good start to helping you look after your wellbeing too! Again this tea has a Sencha base with the citrus-y addition of lemon peel and natural lemon flavour. This is a brand new green tea, which we have just launched this month!! Fresh, citrusy, refreshing and sweet, ideal for all you lemon lovers. The wonderful citrus aromas of this brewed green tea and tingling, fresh lemon peel complement one another perfectly. P.s It's currently our 'Tea of the Month' so you can pick up your bag half price! A punchy, full flavoured tightly rolled leaf. An all day classic. The tighter the roll, the better the quality, plus a beautiful tea to watch - as soon as this tea is introduced to hot water, it unfurls and springs back to life releasing those rich, roasted flavours. This is a combination of our Gunpowder green tea and Nana Mint. Combined they create a delicious, aromatic tea with numerous health benefits. Sweet, fresh and cooling... winner! Our Organic sencha with pieces of cherries. This is the ideal tea if you're looking for something a little bit different. The juicy cherries give a subtle sweet edge to this big leaf green tea. Perfectly light for green tea drinking beginners - don't forget the brewing temp though! So many people make the mistake of brewing too high, resulting in that nasty bitter taste so many of us associate with green tea!! This is a fun, little green tea. Nicknamed 'popcorn tea' because when roasted the small grains of rice pop into what look and taste like mini popcorns. Our Genmaicha tea is a blend of Organic bancha and Organic roasted rice. Under the heat of firing the rice pops - giving a delicious, savoury, buttery popcorn flavour! Jasmine flowers and green tea are meant to be together! This is a favourite in China as Zoë and her sister found out when they visited last year, you can't go any where without being offered Jasmine green - it's like a Breakfast tea in Britain!! This Suki version is a flavour combination that gives the depth of green tea aromatics balanced with the sweet flora taste of Jasmine. Jasmine Green Tea is Suki Tea's deluxe floral fragrant green tea offering with premium fresh beautiful jasmine petals. The most interesting and unusual looking tea! These beautiful green leaf tea pearls are hand rolled and placed beneath August Jasmine bloom, absorbing its magical scent. The process is repeated several times with fresh flowers to enhance the wonderful fragrant flavour, ensuring this is some of the best Jasmine tea you'll ever, ever have. A real treat for all jasmine lovers. Organic stone ground green tea. Matcha tea is the foundation of the ancient Japanese tea ceremony. Shade grown and stone ground the traditional way, this ceremonial, fine grade Matcha is perfect for your favourite coconut/almond/Oat milk lattes or (for those Matcha fanatics) a punchy shot! Slightly Sweet, Fresh, Grassy. Get involved in the Matcha Challenge, the perfect way to boost your well-being! Not usually a green tea fan? Are you used to a bitter tasting, unappealing green tea? This is a problem which is easily solved! Are you using boiling water to prepare your tea? Instead the optimum temperature for green tea is 70-80°C. Green tea leaves are particularly sensitive due to their lack of processing. The boiling water burns the delicate leaf and this is what causes the unpleasant, bitter taste we have unfortunately been subjected too. Also, be careful not to steep the green tea for too long, we recommend 3 minutes, definitely no longer than 5 minutes. 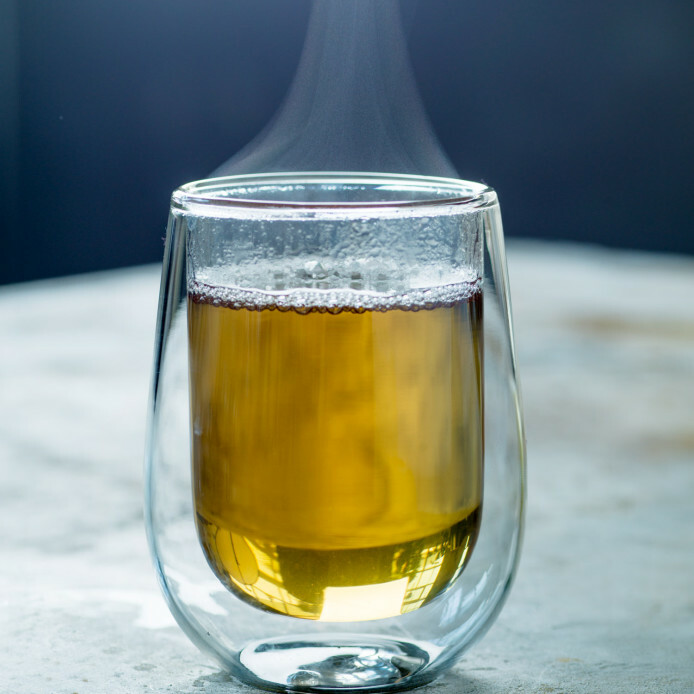 Your green tea, made the correct way should be light, yet flavourful, with subtle tasting notes shining through the cup.